Please note: Some of the links to quoted articles no longer exist on-line. In time I will try and find similar articles. It is unfortunate that many of these fine articles have been removed. It is frustrating to say the least. I am careful not to add entire articles and quote only sections with a short explanation which is the correct thing to do of course because of copyright. However when several articles are removed it can ruin my entire webpage. Why people do this I cannot imagine. It can't be lack of space as most website hosts offer enormous amounts of space either for free or comparatively low cost. All this does in my opinion is impede the course of animal rights and encourages people to violate copyrights. It is important to keep all accounts that further the rights of animals on-line as records of our ongoing struggle to secure for animals the right to their lives free from exploitation and abuse. Cows where thought to have been domesticated approximately 5000 years ago. For clarity lets firstly establish the definitions. A cow is an adult female, a baby is called a calf and a female who has not yet had a calf is called an heifer and a bull is an adult male. Collectively they are called cattle. However it is quite common for people to refer to cattle as cows regardless of the above classifications and for ease of writing I will occasionally do likewise when referring to cattle in general terms. Recently, as we walked along the foot path near to a field in the Northumbrian hills we could hear the dull sound of distant explosions, army manoeuvres I knew, but nonetheless the noise was unsettling. Cows grazing in a nearby field approached us expectantly, quietly mooing, loosing their shyness and aloofness as though wanting reassurance. Many people see cows as indifferent, unresponsive but like other farm animals such misconceptions are dispelled as soon as you have contact with them, even brief contact as above and you will realise there is more to cows than docile servitude. I do not know if it did any good but we calmly talked to the cows who where clearly troubled by these sounds. Cows to many people are a metaphor for mindless passivity, as they appear to graze seemingly oblivious to the world around them. Yet behind this placid facade cows feel pain, fear and anxiety and they worry about the future, they have emotions, form friendships, bear grudges and in the right circumstances they feel happiness and experience pleasure, they have long memories and just like us they are capable of learning from each other, have individual personalities and cognitive abilities: in short they are sentient. There is much scientific and anecdotal evidence that shows us that underneath their docility is a thinking, feeling, aware being. Cows understand cause and effect, this is indicative of advanced cognitive abilities which demonstrates that they are aware. Research studies show us that cows understand cause and effect, for instance cows have learnt that when they are thirsty that pushing a lever to operate a drinking fountain provides them with water and when they are hungry cows have learnt that pressing a button with their heads provides them with food. Like humans cows soon learn to keep away from that which causes them pain, such as electrical fences, and moreover cows learn from the experience of other cows and once one or two cows have experienced pain due to contact with an electrical fence other cows avoid similar contact. Indeed the ability to learn from one another is yet another example that cows are intelligent and sentient. Furthermore this ability is on a par with a dog and higher than a cat. Cows have remarkable memories, among the many things they recall are human faces, they have good spatial memory; this means they recall where things are located. In the wild cows remember watering holes, migration routes, the best places to shelter and the best eating spots in the pasture. And it goes without saying that they of course remember their own calf, in fact a very close bond exists between a mother and her calf as I shall mention again in more detail later. It seems that cows know which herbs are medicinal, perhaps like sheep who possess similar knowledge this is passed down from generation to generation. They seem to understand which herbs to eat whenever they are ill and have been observed to eat plants not normally part of their diet. Cows like all animals are individuals with their own personalities as diverse as that of your cat or dog or indeed other humans. Some are intelligent, others less so, some are timid, nervous, others are more bold coming up to you as you approach them, some are friendly while others can be aggressive although this is rare, some may be compassionate, others indifferent. In her book The Secret Lives of Cows, Rosamund Young says cows “can be highly intelligent, moderately so, or slow to understand; friendly, considerate, aggressive, docile, inventive, dull, proud, or shy." Cows are not the indifferent creatures we assume and may be as curious about you as you are about them. Did you know that cows form social groups within the herd, social hierarchies with leaders chosen based upon their intelligence? The fact that in groups of animals of different age, leaders are amongst the oldest animals suggests that it's not innate, but the result of previous experience," said Bertrand Dumont, lead author of a recent Applied Animal Behavior Science paper on leadership in a group of grazing heifers." The Above is an extract from an article :Study: Cows Excel At Selecting Leaders. Like all other farm animals cows are very similar to humans and experience similar emotions. In a recent article, The Secret Life of Moody Cows, science Editor Jonathan Leake reports findings by scientists conducting research into the behaviour and intelligence of cows. Some of these finding may well surprise you. Cows it seems are intelligent creatures, they even show pleasure by getting excited when they have accomplished the intelligence tests that where set them. 'In one study, researchers challenged the animals with a task where they had to find how to open a door to get some food. An electroencephalograph was used to measure their brainwaves. Read the full article: The secret life of moody cows - Times Online. Unbeknown to most of us cows are indeed complex creatures. Cows can recognize familiar faces. Contrary to common perception cows do not mindlessly moo. Their calls are indications that they experience a variety of emotions, some of which are very intense. These calls indicate pleasure, frustration, excitement and stress, they are used to regain contact when they become isolated and to express grief and anger. Cows will call loudly for days even weeks after their calves have been taken away from them. Cows are sentient beings, they have feelings, their apparent appearance of docility may simply be an acceptance of their lot in life, docility is often a mark of depression, acceptance or resignation. Cows are not milk making machines spontaneously producing milk at our behest. Like humans, cows in their natural environment and circumstances without human interference lactate only to produce milk for their new born. Cows are very much like ourselves when it comes to their offspring, like us the gestation period is nine months, in their natural environment a calf will suckle for nine to twelve months. Before giving birth in the wild cows will separate themselves from the rest of the herd and hide their calves for several days after giving birth. This is done to prevent intrusion from other females which may interfere with bonding. After only five minutes cows develop a strong bond with their calf so you can understand the trauma of separation, a trauma much like or the same as that experienced by a human mother. Such emotion of this intensity shows that these creatures are sentient, the lament of a cow denied her newborn is one of the most unmistakeable indications of sentience. Here are two stories of the great bond between mother cows and their offspring. 'I arrived at the house on a late October afternoon. The fall leaves were in full blazing glory, and I noticed that the cows were even closer to the house than I had expected. I could actually hear them before I got out of my car. When I turned off the engine, I knew immediately that something was terribly wrong. I witnessed a scene of chaos. Cows bellowed and stomped, staggering around the fields. They banged into each other and pushed against the fence, located approximately 20 feet from my car. Dozens of them stood wild-eyed, snuffing the air, shrieking horribly. Unfortunately, I knew all too well what their confusion and turmoil was about." "They've taken your babies," I said sadly, looking directly into one cow's mournful eyes. They rolled back in her head as she bellowed anew. Feeling sick to the pit of my stomach, I entered the house and spoke to the curator, who also lives there. Her name is Mary. "Those cows are frantic," I said. The wailing penetrated even inside. I had never heard anything like it. "How long will this go on?" I asked. "Until tomorrow," she replied. "Then more slaughter trucks will come for them, and it will all be over." I thought my heart would hit the floor. I recalled the intense moment when I had stared at the woeful mother cow, practically eyeball to eyeball." Dancer is a cow rescued after being sent to auction, because of a ripped teat she no longer was of use as a milk producing machine. She had previously given birth to five calves who had them mercilessly taken from her straight after birth, and she thereafter endured the misery of the milking machine which took from her by force the milk meant for her precious calf. Five, perhaps six, such babies Dancer had born. From the time she was physically able to have babies, she had carried and birthed a baby a year.For two hundred and seventy nine days each year, she carried her baby curled high in her belly, close to her heart, while the machines sucked and sucked at her teats, sucking the milk of the baby before. One day of each year she spent giving birth, twenty-four hours to nurse her baby, nuzzling and washing and nurturing the tiny creature with her rich colostrum. Then they would come as they always came, the soul-dead tenders of the hydra machines, and kick and curse her back and seize her baby and drag it away, boys to the vealers, girls to be raised for the same servitude as their mother. Ah, god, the dreadful, dreadful, mooo-moaning bellow of the two, such a keening knell of awful anguish that surely must move a stone to pity...to no avail. "I did not have a pickup. All I had was a 1983 much-abused Toyota 4-wheel-drive wagon. Nine a.m. came and Dancer was still in her star-thistle fortress. In retrospect, the story is funny. It was serious at the time. Knowing Dancer’s history, the whole notion of picking up and moving her calf was anathema to me. How do we explain to them that the sometimes horrible things we do to them we do out of love, in their best interests to the very best of our soul-searching perceptions? Anyone who has trapped and taken a feral cat to the vet knows exactly the torn feelings. That was how I approached Dancer, torn. I knew that picking up her calf would bring back all the nightmares of all her other calves, the dreadful desolation. I knew it would also be but momentary. The sun was already burning down. She and her calf had to move from her thorn fortress into the shade." Dancer's rescuer was Lois Flynne who was the director of The Community of Compassion for Animal's sanctuary in Orland, California. Like all animals cows do not want to be separated from their offspring nor their families and social groups, moreover they like us and every single being on the planet, they do not want to die. In their determination to escape the slaughter house cows have been known to jump six foot high fences and swim across rivers, to name just two of the many feats cows have been known to accomplish. In an article Gentle Giants in Go Veg.com's website concerning the emotions of cows, the following two examples describe the incredible resourcefulness and determination on the part of cows to escape death and in one case save her unborn calf. "A cow named Suzie was about to be loaded on a freighter bound for Venezuela when she turned around, ran back down the gangplank, and leaped into the river. Even though she was pregnant, or perhaps because she was pregnant, she managed to swim all the way across the river, eluding capture for several days. (Believe it or not, cows actually love swimming!) She was rescued by PETA and sent to a sanctuary for farmed animals. When workers at a slaughterhouse in Massachusetts went on break, Emily the cow made a break of her own. She took a tremendous leap over a five-foot gate and escaped into the woods, surviving for several weeks in New England’s snowiest winter in a decade, cleverly refusing to touch the hay put out to lure her back to the slaughterhouse. When she was eventually caught by the owners of a nearby sanctuary, public outcry demanded that the slaughterhouse allow the sanctuary to buy her for one dollar. Today, Emily is living happily in Massachusetts, a testimony to the fact that eating meat means eating animals who don’t want to die." In his book The Pig who Sang to the Moon Jeffrey Masson tells us that some early writers on the subject understood that not only did cattle have interesting minds but that it was also possible to form relationships with them . Moreover cattle where capable of grief and deep emotion. I was suddenly aroused by a most terrific noise, a mixture of loud roaring and deep moans which had the most appalling effect at so late an hour. I immediately went out attended by the Indians, when I found close to the ranch a large herd of bullocks collected from the surrounding country; they has encompassed the spot where a bullock had been killed (butchered) in the morning, and they appeared to be in the greatest state of grief, and rage: they roared, they moaned, they tore the ground with their feet, and bellowed the most hideous chorus that could be imagined, and it was with the greatest difficulty that they could be driven away by men and dogs. Since than, I have observed the scene by daylight, and seen large tears rolling down their cheeks. Is it instinct merely, or does something nearer to reason tell them by the blood, that one of their companions has been butchered? I certainly never again wish to view so painful a sight :- they actually appeared to be reproaching us. "Cattle when first let out into fields following a long winter confinement, tear about the field, kicking their legs into the air. They seem literally to be full of the joys of spring and look for all the world like excited toddlers released into the playground after hours sat behind their desks." The social aspect of reciprocal grooming is immensely pleasurable to cows who often lick one another. Most usually it is mothers licking their calves but also cows affectionately lick other animals and trusted humans. Grooming can be away of relaxing a cow as Jeffrey Masson mentions in the book cited above when describing Rosamund Young's (the author of the Secret Lives of Cows) way of soothing her cows. "Young Carries a brush for soothing disturbed cows who, for instance, have a foreign object lodged in their foot; grooming relaxes the animal enough for Young to remove the offending object. On one occasion, a cow named July so abandoned herself to the pleasure of Young's grooming that she fell asleep." For all animals grooming involving touch is very soothing and pleasurable, cattle like all creatures thrive on a little loving tender care. "Sometimes the connection between animals of different species takes us completely by surprise. An apparent friendship developed between a leopard and a cow in the village of Wghodia Taluka, India. According to wildlife warden Ro-hit Vyas, who has visited the village several times with other animal enthusiasts, the leopard has been visiting the cow regularly for months when their story appeared in The Times Of India. When they meet the ' the fearless cow licks the leopard in its neck and head'." There are many amazing stories that can lead us to the conclusion that cows are intelligent creatures, with emotions, feelings and needs similar to our own. I would like to conclude with a quote from Jeffery Massom. 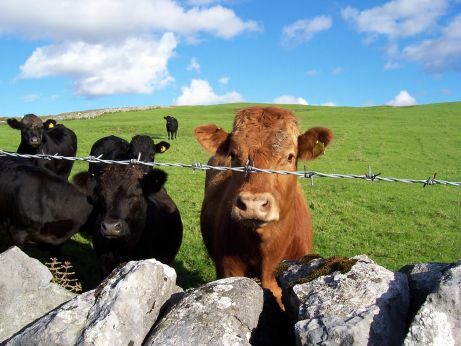 "What I imagined was that the cows where wondering why they where there singled out for death. What kind of a world was it that allowed my family and me, cosy and safe in our new car to simply drive by, where as they and their families where destined to be driven away in a large truck and murdered for their meat? One day far into the future people will marvel that we took the lives of these gentle and beautiful animals to satisfy our greed and gluttony. And one day a family much like mine will drive by and cows much like these will be grazing on a hillside, and those cows will be admired rather than eaten by humans.